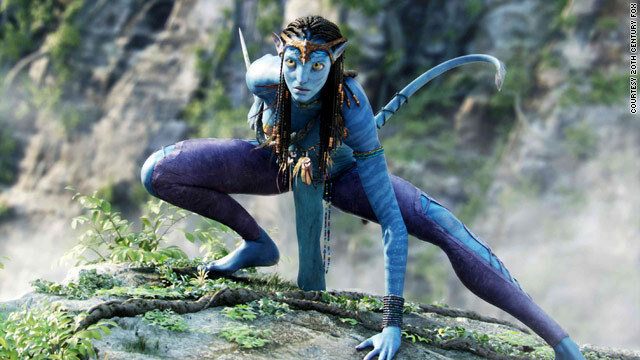 James Cameron's "Avatar" won the Golden Globe award for best movie drama. Los Angeles, California (CNN) -- James Cameron carried home two Golden Globes on Sunday night for his 3-D blockbuster, "Avatar." "Avatar," which has sold $1.6 billion in tickets worldwide in just a month, was chosen best movie drama, while Cameron won for best movie director. "We have the best job in the world," Cameron said. Many of the winners and presenters at the 67th Golden Globes wore red and yellow ribbons, a reminder of Tuesday's devastating earthquake in Haiti. "It does feel strange to dress up and play fantasy, but I'm glad we are talking about it," actress Kyra Sedgwick told CNN on the red carpet. Globe producers included several appeals in the awards broadcast for viewers to donate to Haitian relief efforts. As "Crazy Heart" star Jeff Bridges accepted the best actor in a movie drama award -- the first Golden Globe of his career -- he joked about his lack of awards. "Wow, you're really screwing up my under-appreciated status here," Bridges said. The best actress in a movie drama went to Sandra Bullock for her work in "The Blind Side." Robert Downey Jr. won the Globe for best actor in a movie comedy or musical for his role in "Sherlock Holmes." Downey joked that he didn't have an acceptance speech because his wife told him Matt Damon would win the category for "The Informant!" "The Hangover," a comedy about misadventures in Las Vegas, won the Golden Globe for best comedy or musical movie. Former boxing champ Mike Tyson, who played himself in the film, stood onstage as a movie director Todd Phillips accepted the award. Austrian actor Christoph Waltz won the Golden Globe for best supporting actor in a movie for "Inglourious Basterds." The role of Nazi Colonel Hans Landa -- the villain in Quentin Tarantino's film -- required Waltz to speak four languages fluently. The Golden Globe for best TV drama was awarded to AMC's "Mad Men" for the third straight year. Alec Baldwin repeated his Emmy success at the Globes, winning the best actor in a TV comedy or musical series award. Meryl Streep took home her seventh Golden Globe, one for best actress in a comedy or musical movie, for "Julie & Julia." Streep, referring to last week's earthquake in Haiti, said it was hard for her to put on her "happy movie self, in face of everything I am aware of in the real world." Streep had two chances to win the category, because she was also nominated for "It's Complicated." Kevin Bacon won the Golden Globe for best actor in a made-for-TV miniseries or movie for his acting in HBO's "Taking Chance." It was his first Globe. Bacon, in a CNN interview before the show, asked fans to donate to the Haitian relief through his personal Web site. "Honestly, I've never seen anything like it," Bacon said. "The images are so devastating. I am hopeful and inspired by the way most people are coming together and rallying around it." The Globe for best actress in a made-for-TV miniseries or movie went to Drew Barrymore for HBO's "Gray Gardens." It was her first Globe win after three nominations. Chloe Sevigny, who plays the second wife in HBO's "Big Love," took the best supporting actress Globe for a made-for-TV miniseries or movie. "Up in the Air," which was up for Globes in six categories, won the best screenplay award. Showtime's "Dexter" grabbed Golden Globes for best actor -- Michael C. Hall -- and best supporting actor -- John Lithgow -- in a TV series, miniseries or movie. The best actress in a TV drama series went to Julianna Margulies for her work in "The Good Wife" on CBS. Comedian Mo'Nique won the Golden Globe for best supporting actress in a movie for her role as an abusive mother in "Precious: Based on the Novel 'Push' by Sapphire." "I'm shaking when I tell y'all I'm in the midst of my dream," Mo'Nique said. Toni Collette won the best actress in a TV comedy or musical TV series for Showtime's "United States of Tara." It was Collette's first Globe win, though she has been nominated four times. The Disney-Pixar blockbuster "Up" won the Golden Globe for best animated movie. Pixar has won the category every year since it was started four years ago. "Up" was also honored for best original movie score, which was composed by Michael Giacchino. The award for best original song for a movie went to T Bone Burnett's "The Weary Kind," the theme for "Crazy Heart." The Golden Globe for best foreign language film was given to Germany's "The White Ribbon." Film legend Sophia Loren presented the award. On the red carpet, the earthquake in Haiti and rain over Los Angeles dampened the Golden Globes Sunday evening. Dresses were as glamorous as ever, but the talk was less about the competition and more about the relief efforts under way in Haiti. "It does feel strange to dress up and play fantasy, but I'm glad we are talking about it," said Kyra Sedgwick, nominated for a fifth time as best actress in a TV drama for "The Closer." British comic Ricky Gervais, who is hosting the 67th Golden Globes show, said "someone much more important than me" will address the Haiti tragedy during the NBC telecast. Actress Olivia Wilde, who was already involved in supporting an orphanage and three schools in Haiti, said her Golden Globe dress and several others will be auctioned off with "100 percent of the money going to a local program in Haiti." "It's my way of turning all this fashion madness into something positive," Wilde said. George Clooney, up for a best actor award for his film "Up in the Air," will host a telethon on Friday to raise money for the devastated island nation. "Up in the Air" has six Golden Globe nominated, the most of any other movie. The Golden Globes, produced by the Hollywood Foreign Press Association, is the opening act in the 2010 awards season. Umbrellas were out as a rare rain fell Sunday evening. The first section of the red carpet leading into the Beverly Hilton Hotel was not covered.